Waste is an often overlooked part of our magnificent urban accomplishments – carried away in rich cities and countries by hidden systems, never to be seen again. 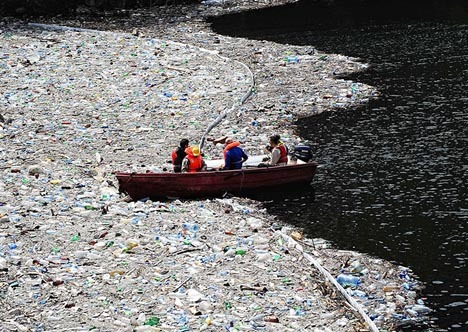 However, there is an inadvertent (perhaps unfortunate) art that has arisen around the photography of garbage that clogs the lakes, creeks, streams and rivers of the less-developed and more-impoverished world. In some places, trash scavengers and swimmers have been documented, in some cases collecting waste of a particular kind to recycle or reuse and in other instances finding dead fish to use as animal feed – a highly unsafe practice due to disease potential, though of course not as unsafe as bathing, swimming or scavenging extensively in these polluted waters. There are poor neighborhoods with so much trash covering their waterways that rats can run across it – as well as the cats that chase them. There are other locations where rapid urban development has outpaced garbage collecting systems, resulting in similar effects.